I thought that a little bit about the history of Whitehorse and the Yukon would help put some context to our trip “North of 60”. The Yukon territory was established on June 13, 1898, although the name, of Amerindian origin, was first applied to the river and is from Yu- kun-ah, meaning “great river”. It was first noted in 1846 by John Bell (1799-1868) an employee of the Hudson’s Bay Company, “who called it by what he understood to be its Indian [name]”. Archaeological work shows evidence that First Nations people have frequented the Whitehorse area for many thousands of years. There were seasonal fish camps above and below Miles Canyon and the Whitehorse Rapids, and First Nations trails extended along the banks of the river. Early explorers had little contact with the indigenous population, although Frederick Schwatka (the lake was named for him), in 1883, made note of a First Nations portage trail bypassing Miles Canyon, and George Mercer Dawson, in 1887, noted the large number of salmon above the canyon – salmon were one of the fish that were important to the aboriginal population. Traditionally, First Nations people were very mobile, covering hundreds of square kilometers in their annual round of fishing, hunting and trapping. The Whitehorse area was probably part of the seasonal round of the Southern Tutchone and Tagish peoples of the Yukon interior, and Tlingit peoples from the coast were frequent visitors for trade. The Southern Tutchone of the Whitehorse area call themselves Kwänlin Dun, or people of the rapids. Coastal and inland First Nations had extensive trading networks along the Yukon River. European incursions into the area only began early in the 19th century with the fur trade, followed by missionaries. By the 1870s and 1880s gold miners began to arrive. Located at the head of navigation on the Yukon River, in 1898 Whitehorse became a temporary stopping point – past 2 major obstacles on the river, Miles Canyon and the Whitehorse Rapids – for prospectors during the Klondike Gold Rush. On August 16, 1896, Skookum Jim, Tagish Charlie and George Washington Carmack found gold in the Klondike, and the Yukon was changed forever. It was nearly a year, however, before the outside world knew about the find; the steamship Excelsior arrived from the north in San Francisco on July 15, 1897, and the Portland arrived in Seattle two days later. Newspapers trumpeted the story of “a ton of gold” being on board. Word of the gold strike had already filtered out to miners and prospectors working in the north. In the early part of 1897 most of the people travelling from Skagway over the Chilkoot Pass and on to Dawson were still experienced prospectors. It’s a matter of some speculation why the Klondike Gold Rush captured the imagination of so many people. But the world was under the grip of a severe recession at the time and the press played on the sensational wealth of the Klondike prospectors. The media helped create the idea of a land where riches just lay in the ground for anyone to dig up and carry away. Tens of thousands of people took the bait, and they packed their bags for Dawson City. Although steamers could travel along the Inside Passage, around the coast of Alaska and then up the Yukon River to Dawson City, this route was very expensive and it was nearly impossible to book a ticket on the Yukon River boats. Most stampeders ended up booking passage to Skagway, where they were faced with two equally daunting overland routes to the Klondike: the Chilkoot or White Pass trails. Images of a never-ending stream of men labouring up the icy steps of the final ascent to the Chilkoot Pass summit have come to symbolize the challenges not just of the trail to the Klondike, but of life itself. 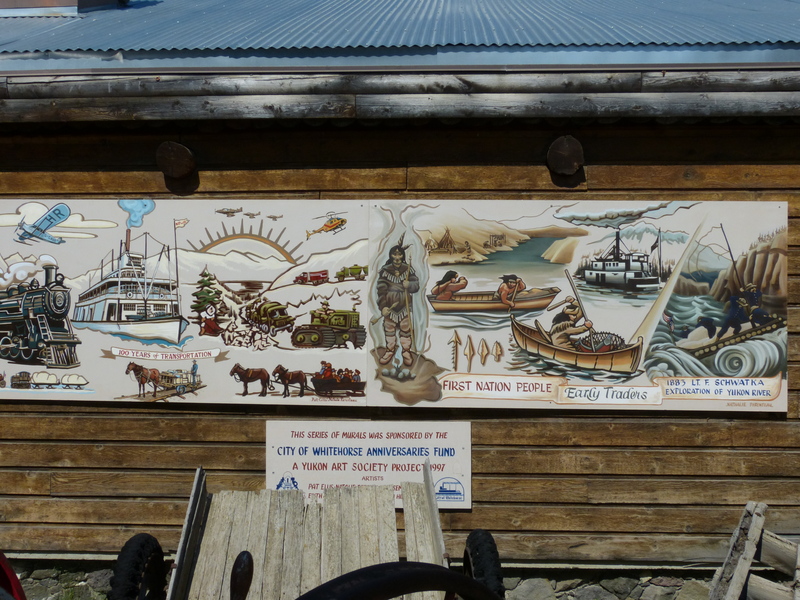 To reach the gold fields most took the route through the ports of Dyea and Skagway in Southeast Alaska. Here, the Klondikers could follow either the Chilkoot or the White Pass trails to the Yukon River and then head down the river to the Klondike. Thousands, burdened by heavy loads, made the ascent across the rocky summit 30 or 40 times in order to haul the tonne of supplies. In the fall of 1897, it was thought that the stampeders would put too much strain on the food supply in the Klondike, and that there would be famine and starvation. The North West Mounted Police, under the direction of Sam Steele, implemented the one-ton rule, requiring the stampeders to bring enough supplies to feed themselves for a year in the north. This undoubtedly saved the hides of many inexperienced gold seeker. The winter of 1897/8 the Chilkoot and the White Pass trails reached their zenith of stampeders scrambling towards the Klondike. Among these was writer Jack London who trudged over the White Pass. The Chilkoot Pass trail was steep and hazardous. Rising 1,000 feet in the last ½ mile, it was known as the “golden staircase”: 1,500 steps carved out of snow and ice worked their way to the top of the pass. Too steep for packhorses, stampeders had to “cache” their goods, moving their equipment piecemeal up the mountain. 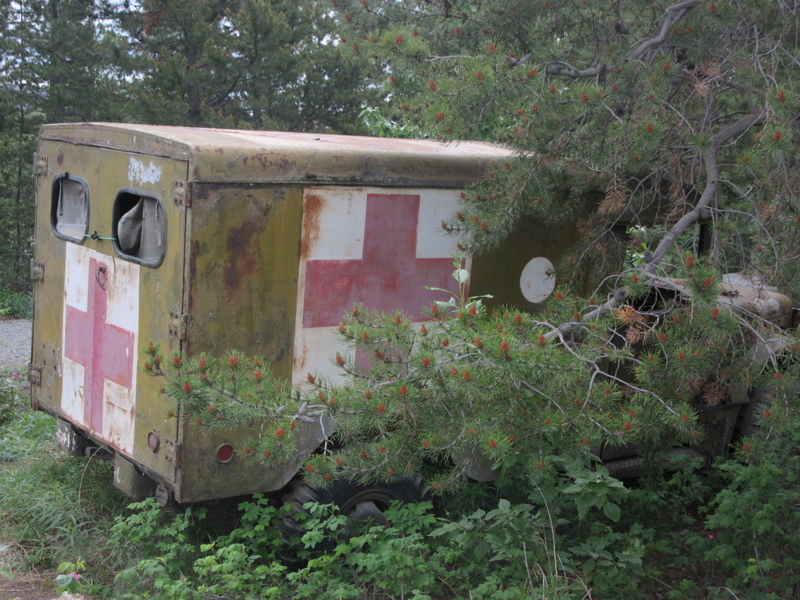 Stampeders who gave up often did it here, discarding their unneeded equipment on the side of the trail. Conditions on the White Pass trail were even more horrendous. Steep, narrow and slick, over 3,000 pack animals died on the trail causing it to be dubbed the “dead horse trail”. Those who made it across the passes found themselves at Bennett Lake in the winter of 1897/8. 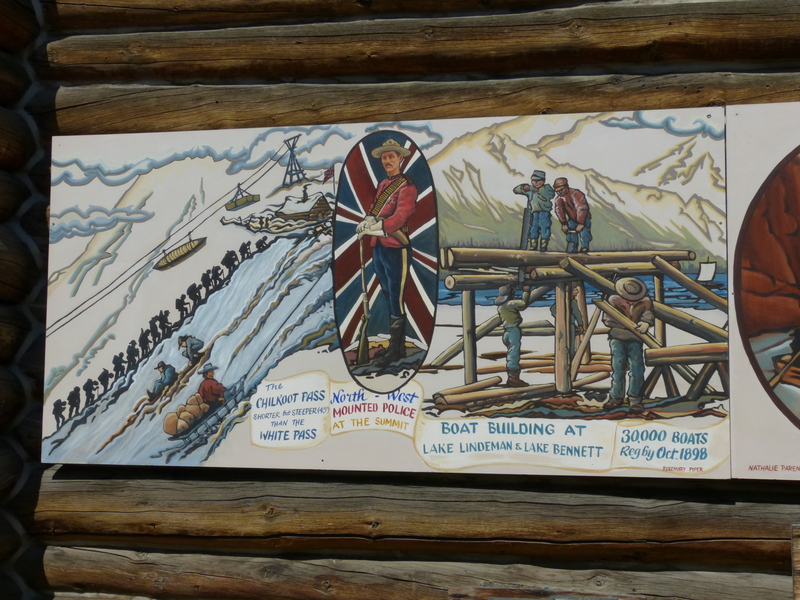 Here, boats had to be built to run the final 800km down the Yukon River to Dawson City and the gold fields. A three-week trip, the miners had to survive many sets of rapids before making it to Dawson City. In the long dark winter months a flurry of boat building denuded the surrounding hillside of trees. When the ice went out on the lakes on May 29 of that year, a rag-tag flotilla of 7,000 barges, rafts and homemade plank boats began their journey up the treacherous Yukon River to Dawson. Many miners lost their lives or their possessions when their boats broke up in the rapids. The rush reached its peak in the spring of 1898. Over 30,000 people poured over the passes, 20,000 of them in the period from the opening of the Customs post in mid-February to the beginning of May. For the thousands of stampeders travelling down the Yukon River to Dawson, Miles Canyon and the Whitehorse Rapids were the most treacherous obstacles on the entire route. Canyon City, at the upstream end of the canyon, was the place where people stopped to plan their next move. Many unloaded their boats and labouriously portaged their goods; a few attempted to run their boats through. When the motley armada finally reached Dawson, the stampeders learned that all the claims had been staked two years before. Many of the would-be prospectors turned around and headed home but others stayed and found wealth in different enterprises. In fact, it is said that more fortunes were made in Dawson by entrepreneurs selling goods and services to the miners, than in the goldfields. The discovery of gold in the Klondike started one of the most remarkable stampedes of people in history. Getting to the goldfields, though, was very difficult, and hundreds of companies were formed to get people there by ship, wagon, horse, dogsled, railroad and even by balloon! 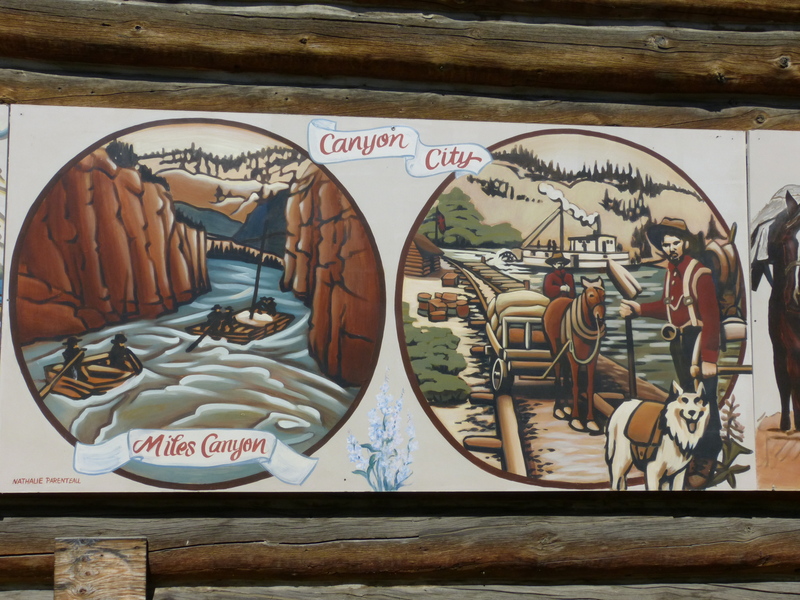 The White Pass & Yukon Route is the only one of those companies which still survives today. 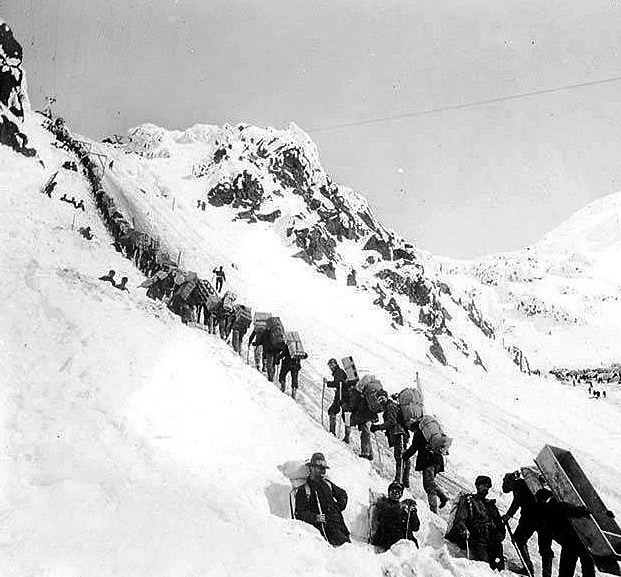 Work on the White Pass and Yukon Route railway began in 1898. The first construction materials arrived in Skagway on May 27, 1898; work started the next day. The narrow-gauge route climbed north out of Skagway through the nearly perpendicular slopes of the White Pass. During the following winter, construction workers faced brutally cold temperatures and immense snowdrifts. The railway connected Carcross and Whitehorse. 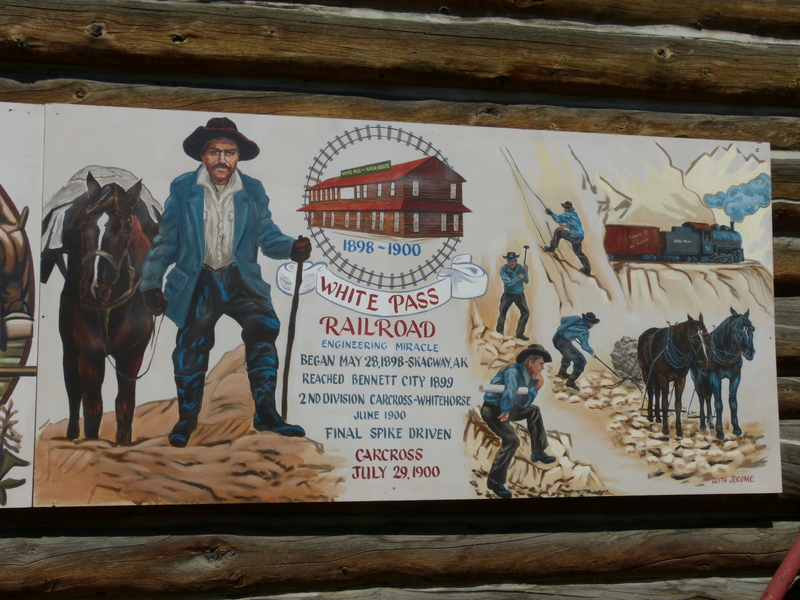 With the completion of the White Pass and Yukon Railway from Skagway in1900, Whitehorse became a permanent settlement. Regularly scheduled freight and passenger service was established to connect Skagway with the riverboat service at Whitehorse. Once in Whitehorse, passengers were able to go by stern wheeler to Dawson City and the gold fields. Finally there was a route to the Klondike gold fields. You can see one of the few remaining sternwheelers, the S.S. Klondike which now sits on the banks of the Yukon River in downtown Whitehorse. From a pre-gold rush figure of under 5,000 people, the population of the Yukon would soar to over 30,000 in 1898. It all ended as quickly as it began. In the summer of 1899, gold was discovered on the sandy beaches of Nome, Alaska. Many of the stampeders who had arrived too late to stake claims in the Klondike left immediately for the new promise of riches. The second great population surge followed the agreement to build the Alaska Highway in 1941. During the nine-month construction period of 1942, the population of Whitehorse swelled from 500 to 8000. After the Japanese attack on Pearl Harbour on December 7, 1941, the United States government was concerned that the transport of troops, equipment and supplies on the Pacific route was vulnerable to attack. The road now called the Alaska Highway was built as a year-round truck route for freight to Alaska. It also provided ground access to a series of airports that had been built to transport supplies to Russia. Construction of the 2500-km road began in March 1942 and was completed on November 20 the same year. The White Pass railway, with its terminus as Whitehorse – halfway between Dawson Creek and Fairbanks – provided access to the Pacific Coast and greatly facilitated construction. The railway was the project’s main supply line and Whitehorse was its principal distribution point. Today as the capital of the Yukon about 1/3 of the population of Whitehorse is employed by the Territorial government.